Averroës (also known as Ibn Rušd or Ibn Rushd; 14 April 1126 – 10 December 1198) was a Muslim polymath from Andalusia. He was a scholar of Greek and Islamic philosophy. He also studied Islamic theology, law, politics, classical music, and the sciences of medicine, psychology, physics, astronomy, geography and mathematics. Averroes was born in Córdoba, Al-Andalus. He lived during a unique period in academic history. Interest in philosophy and theology was failing in the Muslim world but just beginning to become influential in Christian Europe. Averroes himself was influenced by the ideas of Aristotle. His philosophy was often criticised by fellow Muslims. He had a larger influence on Western European society. He has been described as the founder of secular thought in Western Europe. Averroes is most famous for his commentaries of Aristotle's works. Aristotle had been mostly forgotten in the West since the 6th century. Averroes' interpretations of Aristotle's ideas revived Western scholarly interest in Aristotle and ancient Greek philosophy in general. They also led to the development of scholasticism in medieval Europe. 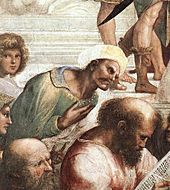 Averroes, close-up of the fresco The School of Athens by Raphael. Averroes was born as ʾAbū l-Walīd Muḥammad bin ʾAḥmad bin Rušd. He was born in 1126 in Andalusia, which at the time was a Muslim country called Al-Andalus. At a young age Averroes had many teachers who helped him begin his study of Islam. He excelled in this and was also interested in law. He began studying medicine in Seville under a man named Abu Jafar al-Turjali. 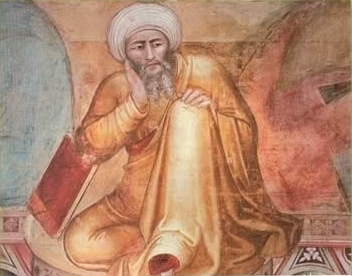 Averroes began his career with the help of Ibn Tufail, a physician at the caliph's court in Marrakesh. He was able to go to Marrakesh and become a physician because of his knowledge of physics. Averroes was granted many honors and became a Qadi (judge) in Seville in 1169. Two years later he became the Qadi of Córdoba. In his free time he studied and wrote. In 1195, Averroes wrote a paper about how he thought philosophy was less than useful for the discovery of religious truth. He was disgraced and many of his papers were burned. The Caliph imprisoned Averroes and exiled him from the country. He lived in Lucena for a short time, then he was brought back by the Caliph to be a judge. He died in 1198. Imaginary debate between Ibn Rushd and Porphyry. Monfredo de Monte Imperiali Liber de herbis, 14th century. Averroes Facts for Kids. Kiddle Encyclopedia.